A story of dangerous incentives, governance abuses, activist investors, and the three companies caught in the middle. Over the past year, Select Income REIT's (NASDAQ:SIR) stock price has fallen by 18%, while Senior Housing Properties (NASDAQ:SNH) and Government Properties Income Trust's (NASDAQ:GOV) prices have been slashed by at least 30%. Even more enticing, the price declines have pushed the companies' dividend yields north of 10%. This is because dividend yield is a company's annual dividend per share divided by its stock price. Since all three companies have held their dividend steady, when the price goes down, yield goes up. However, the track record of poor performance and governance abuses by The RMR Group, which is the external manager of all three companies, is enough to overlook the discount and avoid these companies at all costs. To understand RMR's indiscretions, let's go back to April 2013, when CommonWealth REIT -- which RMR managed at the time -- started getting pressure from a pair of activist investors, Related Management and Corvex Management. The two investment funds owned a combined 9.2% of the company and were pressing for the removal of CommonWealth's board of trustees. Here is an excerpt from one of the letters co-written by the activist investor groups: "Specifically, the flawed RMR structure reduces the company's cash flow, impairs CommonWealth's valuation multiple (40%-plus discount to peers historically), destroys investor confidence, and has resulted in a track record of underperformance." As an external manager, RMR earns fees based on assets under management. This is viewed as a "flawed structure" because it gives RMR incentive to grow assets even if it's not in the best interest of shareholders -- and that's exactly what was happening. From 2010 to 2013, CommonWealth REIT, which invested predominantly in office space, increased assets and shares outstanding by 31%, while book value per share fell by 23%. The company was getting bigger, but each individual share was becoming less valuable. At the time, CommonWealth REIT was RMR's flagship company. Senior Housing Properties, Government Property Income Trust, and Select Income REIT are all former subsidiaries of CommonWealth REIT. The most important of these spinoffs, at least for our purposes, is Select Income REIT -- which owns industrial properties in Hawaii and office space on the mainland. Select Income REIT went public in December 2011, and CommonWealth REIT maintained 56% of Select Income REIT's outstanding shares. As manager of both Select Income REIT as well as Select Income's largest shareholder, CommonWealth REIT, RMR had a stranglehold on the company. But that position was in jeopardy as the scales at CommonWealth REIT tipped, and investors voted to remove the company's board in March 2014. After losing the war over CommonWealth REIT, RMR began scrambling to entrench its position at Select Income REIT, which was in midst of its own investor uprising. This time it was Lakewood Capital sounding alarms that RMR was diluting shareholder value. RMR responded by upping its management termination fee and leveraging Government Property Income Trust to purchase CommonWealth REIT and Lakewood Capital's stake in Select Income for a whopping $785 million. If you didn't know that RMR managed Government Property Income Trust, this would have seemed utterly bizarre. First, it was a massive investment for a company that had $1.7 billion in assets. And second, the company focuses on leasing real estate to the government, which made it that much stranger to invest in a company that owns industrial properties in Hawaii. To make matters worse, Government Properties Income Trust issued 25.5 million new shares of stock to help fund the investment -- which increased shares outstanding by 28%. Select Income REIT has netted Government Properties Income Trust a negative -24% return since June 2014. Senior Housing Properties is somewhat the forgotten man in this story. However, like Select Income REIT and Government Properties Income Trust, Senior Housing Properties is managed by RMR. Also, Barry Portnoy and his son -- who run RMR -- sit on the board of all three companies. And thus, we can see the same issues. 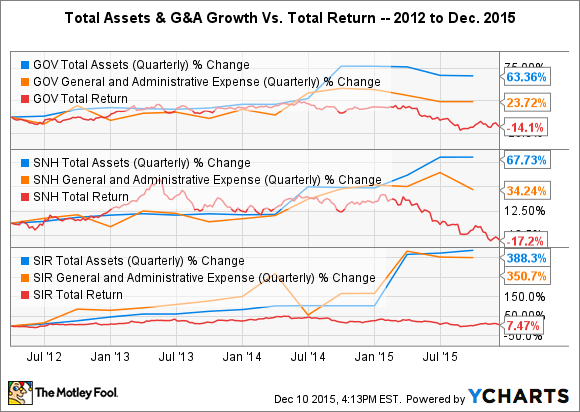 For instance, all three companies have dramatically increased total assets since 2012. This situation has helped to pump up the general and administrative fees they pay to RMR, but it has done nothing to help generate a total return for shareholders. Moreover, RMR has funded much of these acquisitions by issuing a ton of new shares of stock. 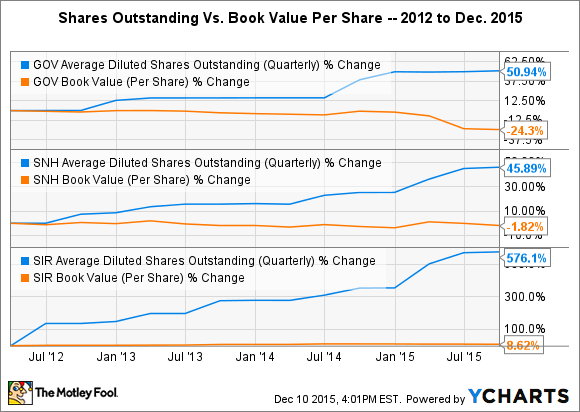 Again, this situation has helped to grow assets and management fees, but it's done little to nothing to improve book value per share. This past October, RMR filed with the SEC and sold 48% of the company to its REITs -- a portion of which will be distributed to investors as a special dividend. RMR believes that giving investors a stake in RMR helps to align interests, and as a public company, RMR will have to disclosure its financials, which could help with transparency. I think this is a step in the right direction, but how do you trust a company that has so blatantly destroyed shareholder value? Unless the situation changes more dramatically, these are three companies I will be avoiding.